It's Book Club Blogger review day and once again I'm playing along. Only this month I'm trying something novel and actually posting my review on the scheduled day having read the entire book. My track record over the past few months has been a teeny bit spotty. But, this month I'm back on the horse and here to play. This month's Book Club Bloggers' selection was The Big Over Easy by Jasper Fforde. 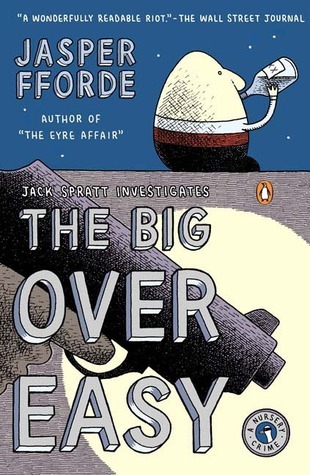 The novel is the first in Fforde's Nursery Crimes series and centers around the murder investigation of Humpty Dumpty. But, let me warn you, this is not yo' mama's Humpty Dumpty. Fforde's Hump is a hard drinking, womanizing man about town. He, like all of the characters in Fforde's novel, represents the darker side of the world of nursery rhymes. And quite simply, I love the idea. For the most part, Fforde's prose is simple to read and easy to keep up with. His characters are surprising and entertaining. The humor is very often tongue in cheek and he managed to keep me guessing until the mystery's resolution. There were even a few scenes in which I found myself laughing out loud at the sheer absurdity of the whole thing. What do you consider perfect vacation reading? For even more reviews of Fforde's work, check out the other book club blogger posts.